My goal is to convince you to go to Bermuda on your next beach vacation. We have just returned from the east coast's Hawaii. Yet I present my theory that Bermuda is far and away better than that little mirage of Pacific islands that is... oh.... NINE hours away. But my point is not to hate on Hawaii -- it's beautiful. I really just want to sing praises from the mountaintops about how wonderful Bermuda is! My parents went to Bermuda for their honeymoon which I think was sort of disastrous (the hotel "misplaced" their reservation... or something) and again for their 10-year anniversary. I was four years old when they went on that trip, but I still remember and kept for a long time a little, pink coral necklace that they brought back for me from the island. I loved that necklace, and actually was hoping to find an adult version of it. I didn't find one, but maybe that's for the best. The beaches are not actually as pink-sanded as I thought. It's more like white sand with tiny pink pebbles that give off the slightest hint of a light pink when water rushes over them. No matter -- my disappointment about the not-so-pink sand was short lived because the Bermudan beaches are hands down the most beautiful I have ever seen in my life. That's saying a lot, considering I am my father's daughter and nothing makes us happier than a good book and the beach and warmer water (Lord knows it takes a LOT to get my dad into any body of water other than the hot tub).... so therefore we have been to some pretty legitimate beach destinations. Think on it, think on it, think on it...... dinggggg ding it is a) South Carolina. You have chosen wisely. But isn't that crazy! Most people think it is further south in the Caribbean somewhere. But no -- a mere two-hour flight from Washington lands you among some of the most beautiful beaches in the world. Each day at the beach, we would lay around reading for an hour or two, then go swimming for a good bit, and then climb barefoot over all of the rock cliffs that separate each of the southern shore beaches. It's a reader's paradise (me) and an explorer's haven (Michael). We rented a scooter. It was such a blast! It is unbelievably fun to scoot around the island on a moped. Assuredly, if I was driving, we would have ended up in the hospital. But that's why I wasn't driving. In fact, I didn't even do any backseat driving (something I tend to do...) since there is not technically a backseat on a scooter. Michael cruised us through the different parishes from one end of the island to the other with a captain's confidence and a light hand on the gas. The scooter rental company won't rent out scooters unless you first prove that you can drive one; as shown by the fact that we ran into some fellow UVA alums who apparently had failed the scooter test and were having to taxi around the island. How terribly sad! It was exhilarating to pop on our scooter with our beach bag and umbrella for the day, and then pop on it again to go out to dinner. Disclaimer: Don't where a slim-fitting dress. I learned that the hard way. It just doesn't work when you have to straddle a seat. Oh well! Michael and I had a wonderful honeymoon two years ago, but we never set foot off the resort property (this is NOT a complaint! I would recommend where we went to anyone) so we didn't have to do a lot of thinking then. On this trip, we decided what beach to visit or where we wanted to go to dinner, then pulled out the map, then scootered there. I kept picturing that scene from The Wedding Planner where the whole group is coming back to the city after a day at the vineyard, and Mossimo, Mary's adorable and squirrelly suitor, is riding along behind the limo and the Land Rover on his scooter. He is whistling. If you know what scene I'm talking about, then we should talk -- we'd probably love all the same romcoms. Anyway, this is how I felt while we went all over the island on the scooter -- like Mossimo riding along happy as a clam as he whistles away. Bottom line: the scooter is worth it. We stayed in a VRBO (vacation rental by owner) little bungalow right on South Shore Road -- a two minute walk from Church Bay, and a five-minute scooter ride from all of the other southern shore beaches. I can't recommend our little casita enough. Our bungalow was owned by the most charming woman I have ever met.... her personality reminded me of Meryl Streep's character from It's Complicated. 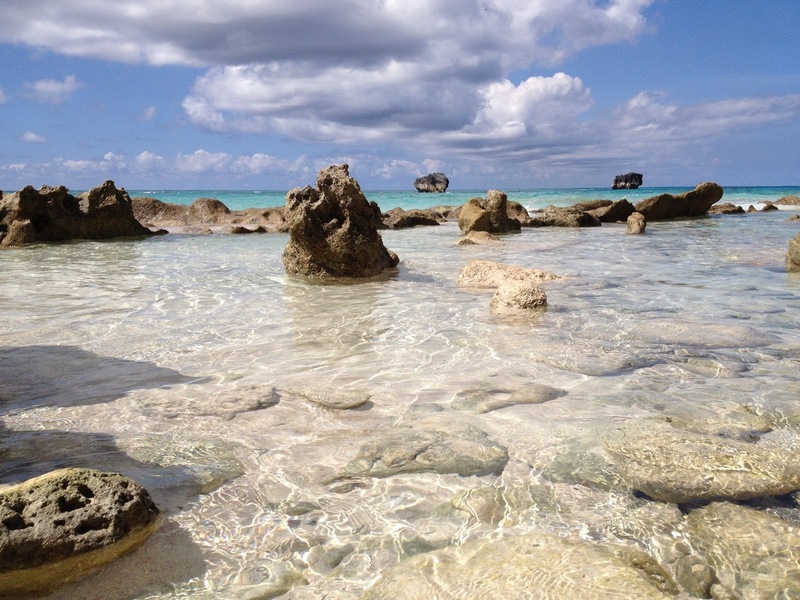 I could go on and on about where we stayed, where we ate, which beaches we loved, etc, but just let me know if you are going to Bermuda anytime soon, or not soon, and we can chat all about it. I think one of the things that amazed us the most about the island is that there were NO TOURISTS. Like anywhere. Ok, there were a few, but I mean, not really. We would hurry to the beach every morning thinking that we'd have to crawl over people to find a spot of sand, but every time, we were either the first of only five other people on the beach.... or there were only five other people on the beach. We did stumble upon the tourist mecca though -- all the cruise ship folks are bused to Horseshoe Bay for their fun in the sun. But if you just avoid that bay, you really do feel like you have an entire island to yourselves. Moving on. It may have taken me two years to figure this out, but Michael and I do not have the same skin tone. As much as I hate to say it, I had to purchase -- as in hand over money and walk out of the store with -- SPF 50 sunscreen. While SPF 15 has always suited me, I clearly was not considering the effects of Bermuda's incredibly strong sun on my man's skin. He fried. I mean, like a lobster. And then he poured Gold Bond powder all over himself because we somehow had that with us and because the bottle said it helps treats minor burns. Do you know what it's like sleeping next to a lobster ghost? So, I found myself, for the first time in my life, purchasing sunscreen with a SPF higher than 30. I felt like I had betrayed the sun-gods and they were going to rain down on me. As in, literally rain. As in, no sunshine for the rest of the week. A horrible thought! Thankfully, this didn't happen. We had gorgeous weather all week. I basked in the sunshine, while Michael sat under an umbrella slathered in 50. Poor man. Thankfully, a friendly Bermudian literally broke off several huge aloe leaves from an aloe plant and showed Michael how to peel the spiky shell off the leaves to expose the aloe underneath. This, you rub on your skin. Amazing! We actually did it too. I felt like Tom Hanks in Castaway. Without the whole knocking out his tooth with an ice-skate thing. Yikes. Lesson learned: Just because you prefer SPF 15, doesn't mean everyone does. Get your man some 50! We were sad to leave such a wonderful place to come back to DC, but honestly, we love our lives in DC too (I know, I know... I talk about it a lot) so neither Michael or I had that sense of foreboding that we both used to have when leaving vacations. Is that a sign of maturity??! Who am I kidding -- we are both old souls. You can read a book anywhere. But it would be better in Bermuda. That would be yours truly. You convinced me! I was reading your post in the car and told Thomas that we are going to Bermuda. Not sure when, but it will happen! Sorry I recommended Horseshoe Bay beach when it was so crowded... It wasn't like that at all when we were there. And then I realized that it's been at least 10 years since our trip. Whoops. Happy anniversary Catalinos! Mere -- you definitely should go! And no worries... Horseshoe Bay is definitely gorgeous like all the beaches! I think they send all the cruise ship folks there because it is the biggest bay and with less rocks in the water. Congrats on your new pup!